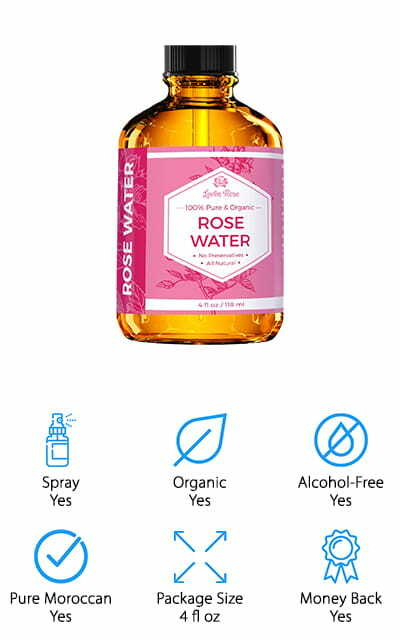 Whether you’re looking to rejuvenate your hair or your skin, you’re going to want to try a rose water toner. These magical mixtures can cleanse and hydrate your face and neck, and can also be used as a hair treatment. We’ve put together this rose water toner buying guide to help you choose one that will work best for your skin and your issues. Before we get started, let’s take a look at some things you should know. Spray: This only refers to whether or not the product comes in a spray bottle. Some toners come in a dropper or a different type of dispenser, but in these bottles, you can spray it onto your skin. Organic: Organic products aren’t processed with any synthetic ingredients. They are usually made from plant-based products that are completely natural, and with a rose water toner, this is important so you know what you’re putting on your skin. Alcohol-Free: In many cases, alcohol can damage or irritate your skin. Choosing a toner without alcohol can mean a shorter shelf life but it can also prevent breakouts and redness in people with super sensitive skin. Pure Moroccan: A large portion of the most high-quality rose water toners come from Moroccan roses. This is widely used among rose water toners to denote quality, so being made or sourced from Morocco is a big deal. Package Size: This is how much you’re going to get. For the most part, you aren’t going to use a lot of toner at once. A little goes a long way, so buy a product based on how often you use it. Money Back Guarantee: Some toners on this list offer a money back guarantee if you aren’t completely satisfied with the product and the way that it works, you can return it for a full refund with no additional hassle. Now that you know everything there is to know about rose water toners, let’s get into the products. Our rose water toner reviews were chosen from a selection of products that we researched and reviewed to get you only the best. Check out our top pick and our budget pick first, but make sure to look through the rest of our products as well! We want to help you on your way to healthier skin, and we’re sure you’ll find what you need here. Our pick for the best rose water toner for sale is this product from Poppy Austin. This is a spa-grade cosmetic product that is meant to hydrate and rejuvenate your skin without irritating it. It’s 100% pure and distilled, as well as being organic and unrefined. It’s made from Moroccan Rose Water, and as a result, it’s rich in antioxidants and perfect for use on all skin types, even for people with sensitive skin. It will absorb excess oils while still providing hydration, soothe any redness that might be happening on your skin, and tighten pores! It’s a great treatment for acne, as it helps to unblock pores and provides treatment for pimples and blackheads. The company boasts that their toner is made by hand in Morocco, and there’s no way to beat that! It’s a responsible sourced, pure Moroccan product that will make your skin look and feel great! We love it! 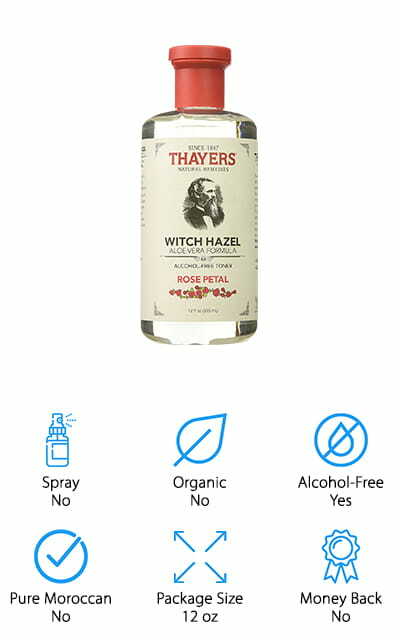 Thayer’s Rose Petal Witch Hazel is our choice for the best cheap rose water toner. It’s affordable, and there’s a lot of toner for the price – which definitely increases the value astronomically. There’s a full 12 oz of toner at this price, which is a pretty amazing deal. It’s a soothing blend that’s made with Rose-petal water, Vitamin E, and an ingredient that some of the other toners on our list don’t include: Witch Hazel. This herbal extract helps to tone your skin and draw up any loose pores, leading to a better, more youthful overall look. It’s free of all alcohol and includes another ingredient that we love: aloe vera. This helps reduce inflammation, puffiness, and keeps red and irritated skin feeling a little more at ease. It softens your skin while tightening it, and it smells great as well! It smells like you’re stepping into a field of roses each time you open the bottle! 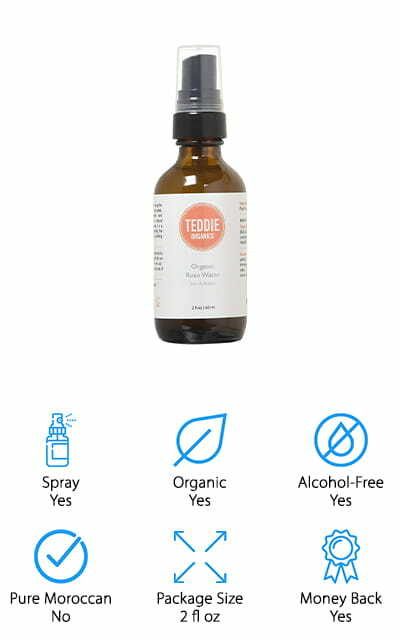 Some of the best rose water toners are this stuff from Teddie Organics. It is one hundred percent pure rose water, and completely organic as well, which is a nice bonus. It helps instantly hydrate your face, and it’s great for all skin types. 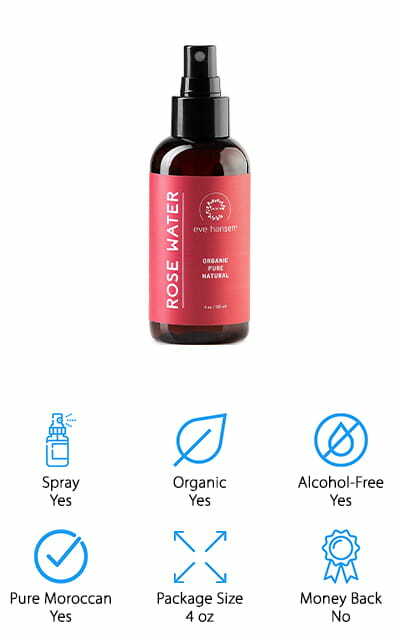 Since its alcohol-free, it won’t irritate your skin as well – for people whose skin is especially sensitive, this is a great alternative to more processed rose water toners! It won’t trigger any of your sensitive skin problems, such as rosacea. This is because the rose water contains an anti-inflammatory agent, so it helps even existing problems go away. You can use it as a makeup remover and along with argan oils and other facial serums to help create a clean palate for applying them. It can even help with sunburns or razor burns, so you can use it on skin that isn’t on your face, as well as in your hair to keep it soft. 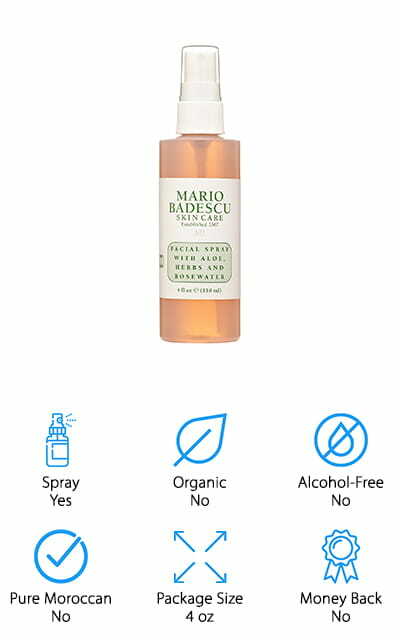 This spray by Mario Badescu is a great fresh rose water toner that you can mist all over your face and neck! It has a pleasing herbal scent thanks to the herbal extracts present in the mixture. You’ll want to use it all the time because it’s so refreshing. It won’t irritate your skin, but it works to hydrate your face and make your skin dewy and great-feeling! It’s safe for all types of skin, even people with sensitive skin or problems that might be irritated by such a product. It also includes aloe to help soothe sunburns or extremely dry skin. It’s great for people who naturally live in dry environments, and it’s also a great rose water toner for oily skin! We love that this hydrating spray won’t disturb your makeup so you can apply it after you set your face in order to feel fresh, clean, and ready for the world all day long! 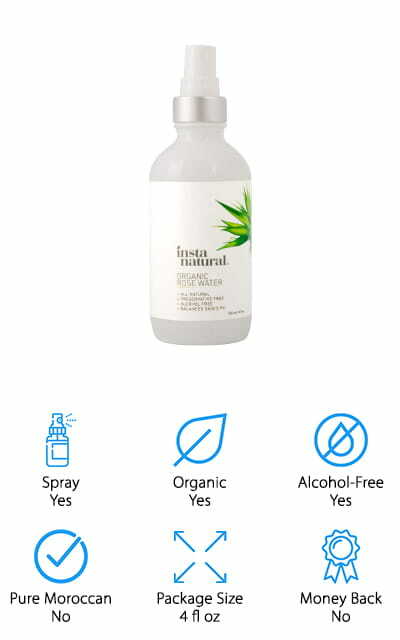 This InstaNatural Rose Water Toner is a great all-natural, skin-soothing treatment to help get hydration back into your skin. This pure rose water toner can easily be loaded into a spray bottle or dabbed onto your skin no matter what type of skin you have. There are no artificial ingredients and it’s completely free of alcohol, so it aims to avoid irritating your skin. You can use it in aromatherapy as well as using it to gently and effectively remove your makeup. There are no artificial fragrances, so the scent is light and perfect for light aromatherapy. We love that there are no chemicals or fillers, and you can even use it on your hair to restore damage caused by excessive heat! Take care of both your hair and your skin with this amazing multi purpose cleanser and toner. Use any lotions or creams after the toner in order to get the skin that looks and feels great! 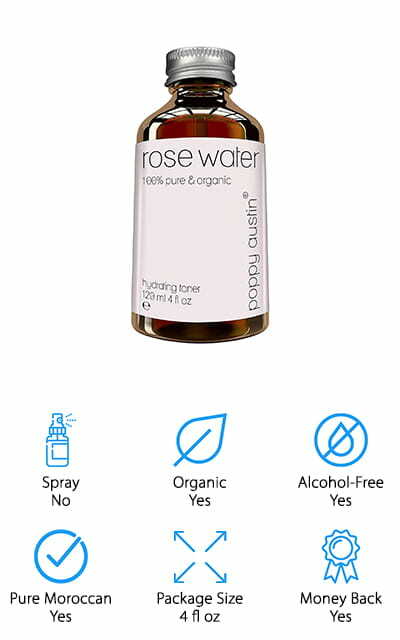 This organic rose water toner by Leven Rose is the perfect base to create a hydrating layer between your makeup or lotion and your skin. For best results, use after washing but before the application of any of your facial products. It’s completely pure and natural, straight from Morocco – which makes it an excellent product for all of your skin-based ails. It’s great for balancing PH on your skin and hair, as well as treating acne-prone skin, dark marks, and oily skin! The anti-inflammatory products will reduce redness on your skin and smell great while doing it, as it’s made completely from fragrant roses. There is no alcohol or glycerin in this mixture, and no artificial perfumes are added. People living a Vegan lifestyle can rejoice because this toner is completely Vegan-friendly. It’s even stored in a dark amber bottle to maintain shelf life! But the best part is the money back guarantee! Our fresh rose water toner reviews wouldn’t be complete without this toner from Eve Hansen. All of the great effects of rose water are present in this great product. It comes in a useful spray bottle so that you can simply spritz it onto your face and hair when you want to use it, or when your hair is dry or your skin irritated. It will help to hydrate and soothe your skin and hair and calm your skin from problems like acne, psoriasis, and chronic dryness. It’s made of high quality rose water, and you can even use it to set your makeup! At the same time, you can use it at the end of the day to remove your makeup, as well as any other excess dirt and oil. Make your skin glow with this natural rose water toner. It will help to unclog your pores and clear up your acne, even for people with acne-prone skin! 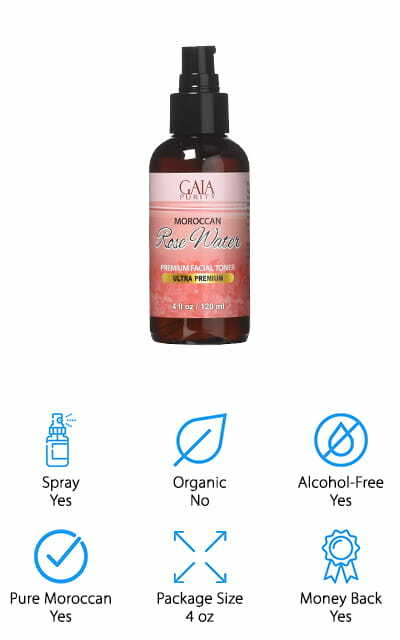 This rose water from Gaia Purity is the perfect addition to our rose water toner reviews! This large 4-ounce bottle of toner is purely Moroccan, so you know that it’s only made of the best roses. It helps condition your hair, helps it to grow and reduces dandruff, all by increasing blood circulation to your scalp! What’s even better is that it has a lifetime warranty, and contains no chemicals, pesticides, or alcohol. Chances are unless you have very specific allergies, it won’t irritate your skin! It helps to remove dirt and you can use it after a long day to take your makeup off. Calm you hair and cleanse and soothe your skin, all in one amazing product. It will help to balance the PH of your skin and clear up your acne and eczema as well as psoriasis. This rose water has so many uses, and you’ll want to keep it in your medicine cabinet for all occasions! Lately, Burt’s Bees has really hit the ground running in the cosmetic industry, with their natural honeycomb-based products. This rose water toner is no different. You can use this toner to help get any trapped dirt or oil out of your pores, as well as using it to remove makeup and the residue from any facial cleanser that you’ve used before applying it. It’s gentle and uses only the finest botanical astringents so that your pores are minimized and your skin is soft and clean without any harsh chemicals. 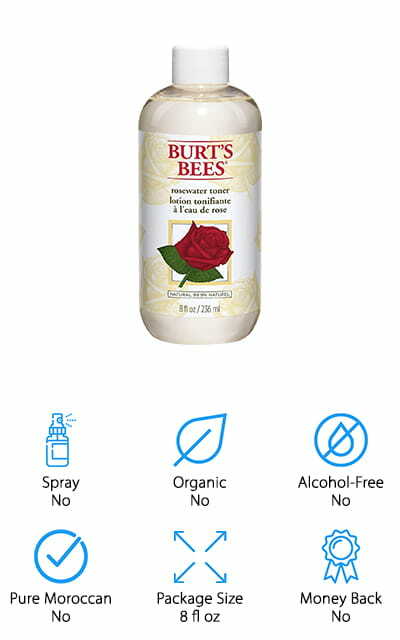 It’s especially effective when you use it in conjunction with your other favorite Burt’s Bees cosmetic products, especially their moisturizers. Rosewater is, of course, an active ingredient in this mixture, but also Aloe Vera and Glycerin to help create a beautiful floral scent that you’re going to love putting on your face for that extra little burst of hydration. We love how natural and effective this toner is! Last up on our list is this rose water toner by Valentia. It’s a high-quality product that is completely organic and certified, as well as being entirely pure rose water free from any synthetic ingredients. It’s cruelty-free, never tested on animals, and unrefined so you are getting the most natural product that you can. The roses are steamed in Turkey to create this mixture, perfectly distilled in the process. Feel more refresh with both the hydrating properties of this rose water and the aromatherapy bonuses, making you feel and look great. It helps to minimize the appearance of your pores naturally, cleansing as it goes and balancing the PH levels on your skin. This helps you clear up any acne, eczema, and other skin issues that you might have going on while cleaning all the excess junk out of your pores. It naturally provides vitamins A, C, D, and B6 to give you the best results!